G1WB is our cute polka dot printed gusset bag that measures 2" x 1 7/8" x 9 1/2". This bag has a white with black polka dots print bordered on the top and bottom. 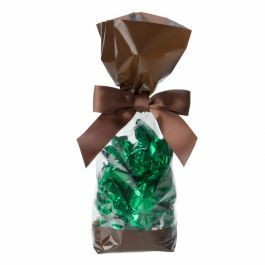 The center of the bag is clear to showcase candy, treats, favors, and more. The material is laminated and bottom-sealed for added durability. 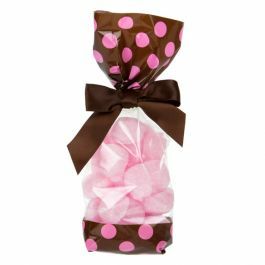 A playful polka dot design is a great match for gifts and favors. The G1WB is designed with a white with black polka dots print on the top and bottom of the bag. The center of the bag is crystal clear to show off your product. Fill this 1.6 mil bag with candy, treats, and gifts. The material is made from laminated material and is bottom-sealed for extra strength. 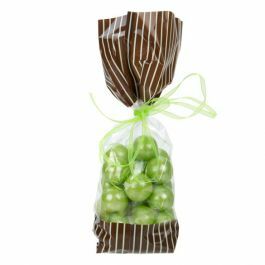 Not only is this 1.6 mil bag durable, but it also has expandable side gussets to accommodate your product. Dress up this festive bag with ribbons or twist ties. Heat seal with a standard hand sealer for a more secure closure. 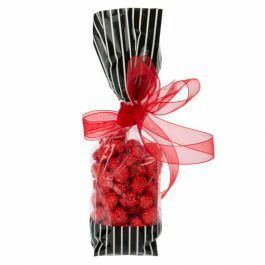 Outer Dimensions: 2" x 1 7/8" x 9 1/2"
Most popular use is for candy and gift packaging.